According to the Bluetooth Special Interest Group (SIG), which oversees the development and licensing of Bluetooth technology, of the 13.9 billion wireless devices estimated to be shipped by 2020, one out of three will be Bluetooth-enabled. For almost two decades, we've enjoyed the convenience of wirelessness thanks to Bluetooth. While we continue to struggle with Bluetooth pairing problems, the Bluetooth standard has evolved, improved and expanded, as have the devices and applications that have adopted it. In December 2016, the Bluetooth SIG officially adopted the Bluetooth 5 specification, which promises to expand the capabilities of, but not replace, Bluetooth v4.2 — the version most devices are equipped with these days. What do we get with the upgrade? In a nutshell, Bluetooth 5 promises a longer range, faster transfer speed, larger data transfer, and a stronger signal — all while maintaining low power consumption and allowing “connectionless” data exchange. The newest specification extends the range of the Bluetooth signal by four times that of Bluetooth v4.2. Moreover, error correction and interference detection in the new spec are expected to make Bluetooth devices emit stronger and more reliable signals by lessening the impact of interference emanating from devices that use closely matched bandwidths. The range extension in Bluetooth 5 makes it a viable replacement for power-hungry Wi-Fi to link up Internet of Things (IoT) devices. Most Wi-Fi-connected smart devices these days need to be plugged in or charged frequently. Smart devices with Bluetooth 5 are expected to be low-energy and won’t eat up electricity as voraciously as Wi-Fi devices do or need to be recharged as often. Moreover, wider signal coverage means that Bluetooth will be available even outside your home. This would allow you, for example, to install wireless security systems in parts of the house that used to be Bluetooth dead spots. Remember when the music on your wireless Bluetooth speakers died the moment you and your phone stepped out of the room? Those days may become a distant memory in the age of Bluetooth 5. Broader coverage also means lower costs for setting up your smart home: You'll no longer need to buy Wi-Fi routers, range extenders, or access points to be able to control your smart devices, such as light bulbs and smart locks. And you won't have to keep playing around with your Wi-Fi setup to make it faster. Communication between paired devices also runs faster (up to 2 Mbps) with Bluetooth 5, as the latest standard doubles the data transfer rate of Bluetooth v4.2. This means that your smartphone will be able to transmit and receive updates from your smartwatch or fitness tracker more quickly than before. Swifter data transfer also means less power consumption — up to half the usual time — which, in turn, doubles your usage time before your device needs to be recharged. Besides faster data transfer, Bluetooth 5 also promises larger transfers, as it increases Bluetooth v4.2’s data broadcast capacity by 800 percent. Bigger broadcast capacity enables Bluetooth devices or beacons to send out small pieces of information to other Bluetooth devices, even if the devices aren't actually paired with each other — that is, “connectionless” transfer. This will enable beacons to beam information snippets and high-quality content, such as advertising messages (including URLs and multimedia), to your device as you move around in public places like airports and malls. Stores can also leverage Bluetooth 5’s ability to broadcast rich data in scenarios that need contextual information, such as location-based services. For instance, to help you quickly locate a particular product, beacons or sensors can be set up all over a store to create a system akin to GPS-like navigation assistance. ABI Research forecasts that shipments of such Bluetooth beacons will exceed 371 million by 2020. 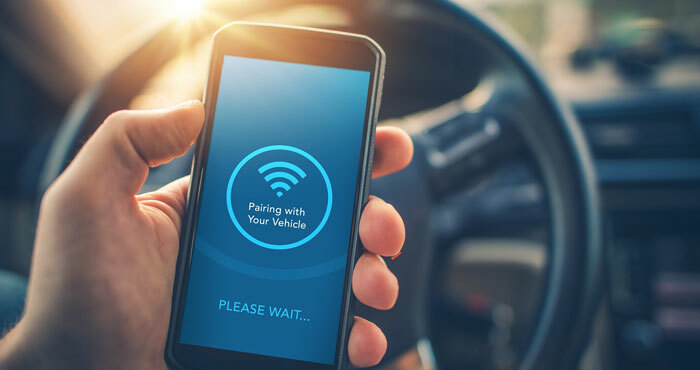 Since they need to interact with many sensors and data sources (e.g., traffic lights) at any given time, self-driving cars could also benefit greatly from Bluetooth 5’s one-to-many data broadcasting capability. And faster and larger data transfer will make it easier to upgrade the firmware on Bluetooth-enabled smart meters, implanted medical devices, and more. Bluetooth 5 opens doors of innovation opportunities in numerous context-aware applications, such as asset-tracking in warehouses, emergency response systems, accessibility for visually impaired people in smart cities, and more. If your current device supports the low-energy features of Bluetooth v4.2, v.4.1 and v4.0, it will still work with devices that implement only the low-energy features of Bluetooth 5. If it supports the Basic Rate/Enhanced Data Rate (BR/EDR) Core Configuration from Bluetooth v1.1 onwards, it will continue to work with Bluetooth 5 devices also implementing BR/EDR Core Configuration. To put it simply, your Bluetooth v4.x devices, such as mice and keyboards, will still work when paired with your new Bluetooth 5 laptop. Frankly, though, to take full advantage of the range and speed improvements of Bluetooth 5, you'll need devices that implement the standard. The first devices with Bluetooth 5 built-in, including the Samsung Galaxy S8 and Galaxy S8+, have already hit the market, with many more coming in 2018.